I started with one little drawing of ampersand with pencil, and I drew one more for fun then another. The drawings had created a pattern after all. So I decided to edit them with Adobe Photoshop. 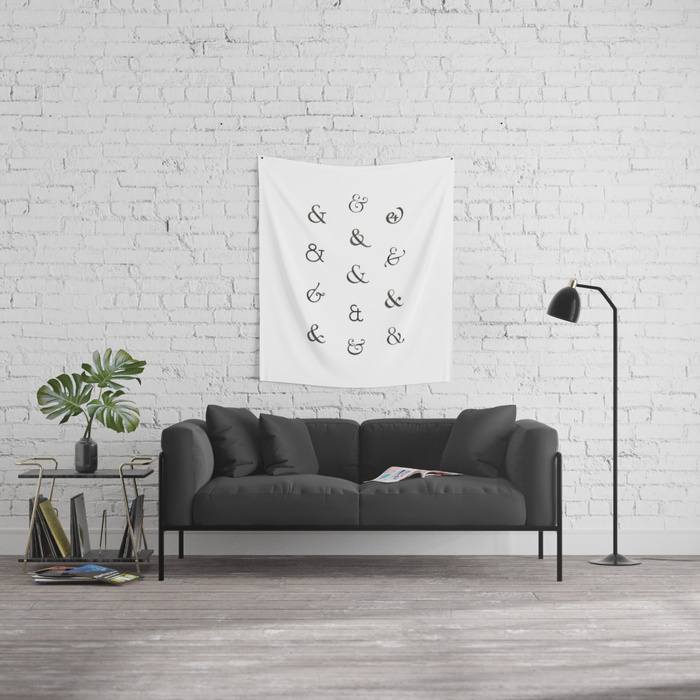 After cleaning and adjusting them I uploaded on Society6 to generate the product images. Then, I traced the original drawings onto rubber block to carve and make it into a stamp. The entire process was fun and exciting! Coming soon with the result images of stamping!!! 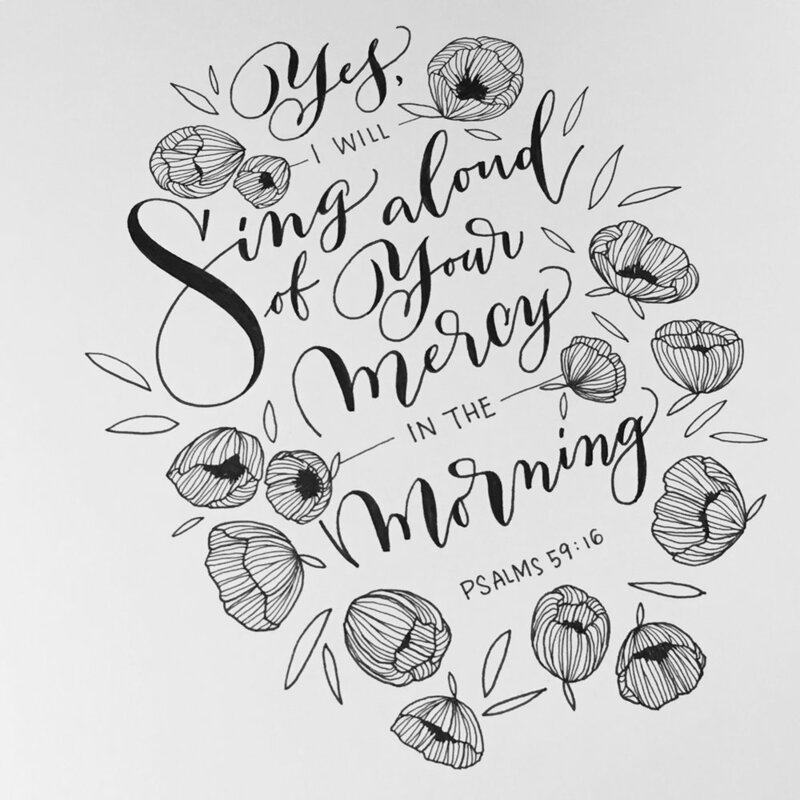 30 days of Bible lettering project has been back on November 1st! This lettering challenge is lead by a few talented lettering artists and numbers of people has been joined this project. Visit their website 30daysofbiblelettering.com to learn more about it. This is actually 3rd round and the first one was on April 2016. Joining the first challenge was very special experience to me personally to build my relationship with God while I was carrying second baby. I could not finish the challenge on time for giving a birth on April 18th and recovering, but lettering His word was the most powerful and amazing thing to do for both me and the unborn baby to keep us in His pouring grace. Follow me on Instagram @hey.jee to see updates of this challenge and process of other lettering posts. Drawing is something I have done for life either seriously or casually. It also something I would never stop doing regardless if I were good at or not. I always like black ink drawn on white paper. This time, I added gold. 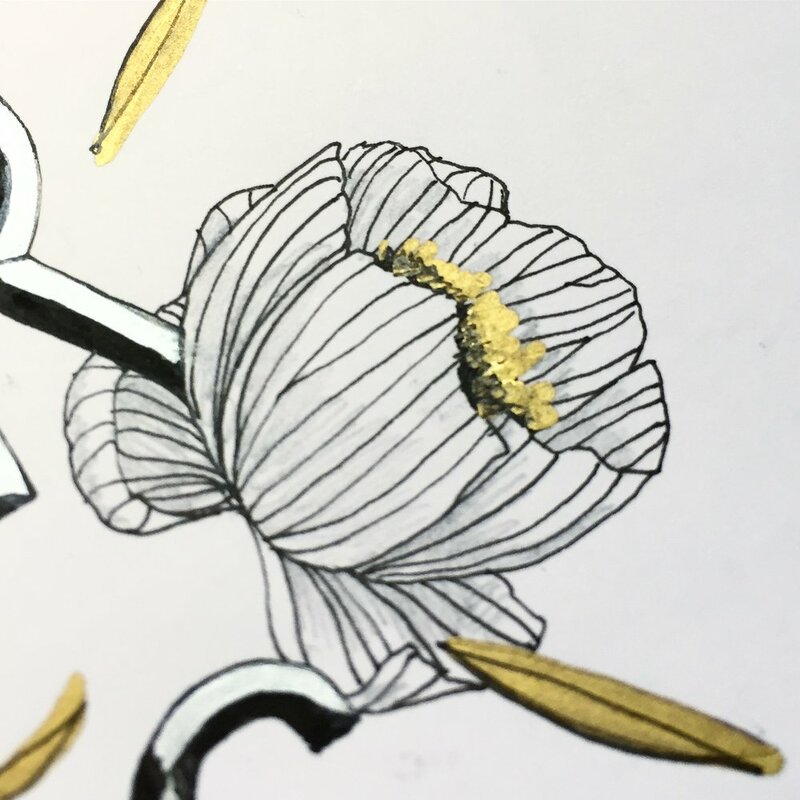 These scattered flowers in various sizes go well with letterforms creating contrast. Follow Instagram @hey.jee to see daily posting. Rough (or thumbnail)sketching is literary done roughly and quickly in a small scale. During this sketching phase, I do sketch many different ideas as quickly as they comes up in mind and do not polish them. I add color with rich black pen to make it solid and pop up if only I want to take that idea further. I usually use Pigma Micron from Sakura for taking outlines of each letters and use Faber-Castell (brush tip) for filling them up. After pick one idea to go with, I redraw it with considerations of its based typefaces, angles and flows. 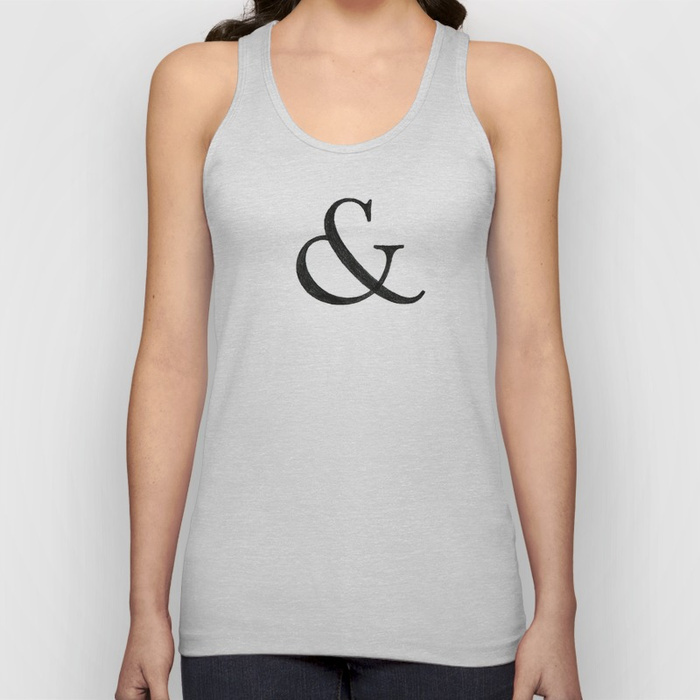 For this particular design, I added drop shadows, decorative lines and flourishes. After developing the idea, I scan the image to enlarge its scale in actual size or large enough to draw details—consider about how pencil dust can smudged on vellum paper. Then print the sketch out and ready to tracing it. 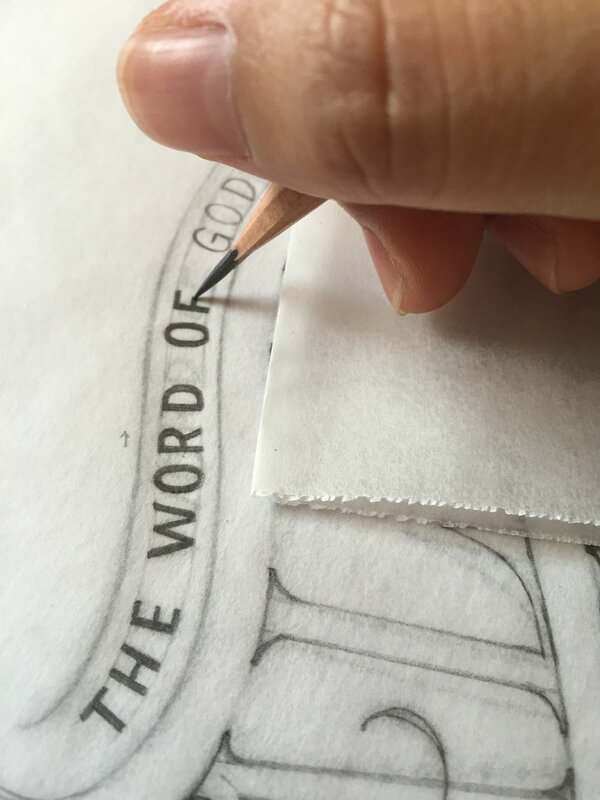 I use pencil H to draw guidelines very lightly on a sheet of vellum layered on top of the printed image. I also use it to draw fine lines and sharp edges. I Fill in the letters with pencil HB or bolder leads, but won't go farther than 2B. Pencils are various in softness. H is for hard and B is for bold, so HB is in the middle and generally used for both writing and drawing. F is for fine point, and I figured it is somewhat between HB and H.
Even though the final artwork will be in light color or no colors, at this sketch phase, the letters are better be filled with black. It helps to see the relationship and spacing of each letters. It also creates great contrast that helps to see entire composition clearly. I photograph the process often not only because of recording them but also refreshing my eyes. I often times noticed some flaws to fix by looking at the artwork in small scale through a smart phone display or a camera display. As finishing up drawing tightly, I scan the artwork in high resolution as 300dpi. Then open up the image to Adobe Photoshop to edit. I adjust its level to maximize its contrast and erase guidelines and dirts. Also fix some flaws, touch up details and adjust letter spaces. For this artwork, I straightened and aligned the "E" at the end of "Alive" with "I" of "Active." This post is for a list of words related to typography and graphic design. This will be updated constantly. It originated as a ligature of cursive letters 'e' and 't,' invented in 63 BC by Marcus Tirus as shorthand for 'et' which means 'and' in Latin. a part of a letter that extends above the x-height. Lower case letters, b, d, h, k, l and t have ascender. a part of a letter that extends below the baseline such as lower case letters, f, g, j, p, q and y.
a punctuation mark has size of letter 'm' that may be used for denoting a break in a sentence. Also it may be used before a source of a quote. a punctuation mark has size of letter 'n' that may be used as replacement of 'to' between two different numbers in order like 2013–2016. Hyphen "-" is shorter than en dash, and it is used for connecting two nouns. Also it is used to break a word with multiple syllabus which called "hyphenation." 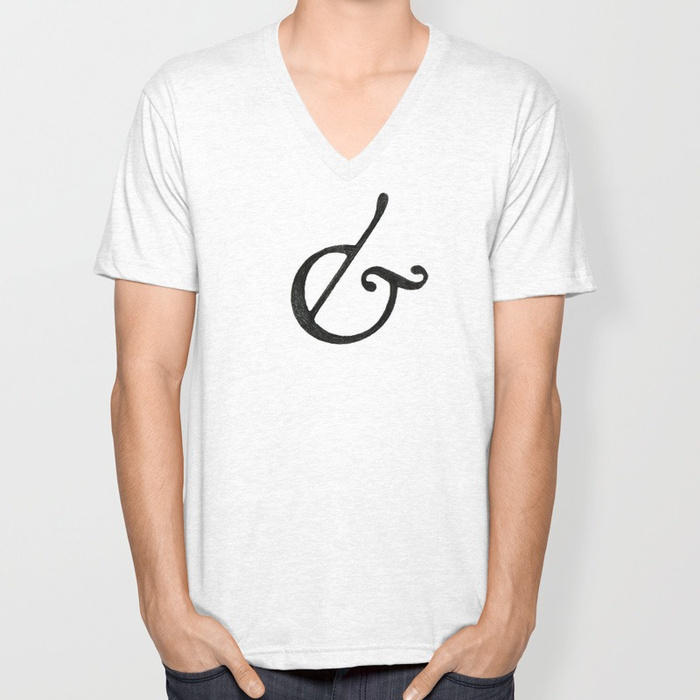 a sign or character representing a word or phrase, such as those used in shorthand and some writing systems. a character consisting of two or more joined letters, e.g., æ, fl. a part of a letter that extends a smidge above the cap-heigh or below the baseline. Such letters that have round like O or have apex/vertex like A and V are optically in right size comparable to other letters when they "overshoot" because of the human eye perception. Otherwise, those particular letters look smaller than the rest of the letters. 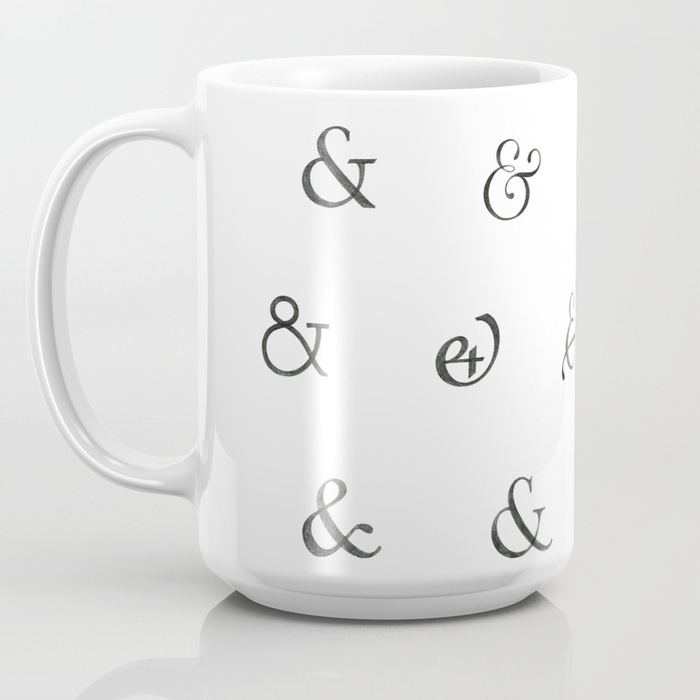 The ampersand is the logogram '&,' a ligature of cursive letters 'e' and 't,' as shorthand for 'et' which means 'and' in Latin. For these couple days, I have done idea sketches of ampersands to find one good solid shape for the self initiative lettering project. 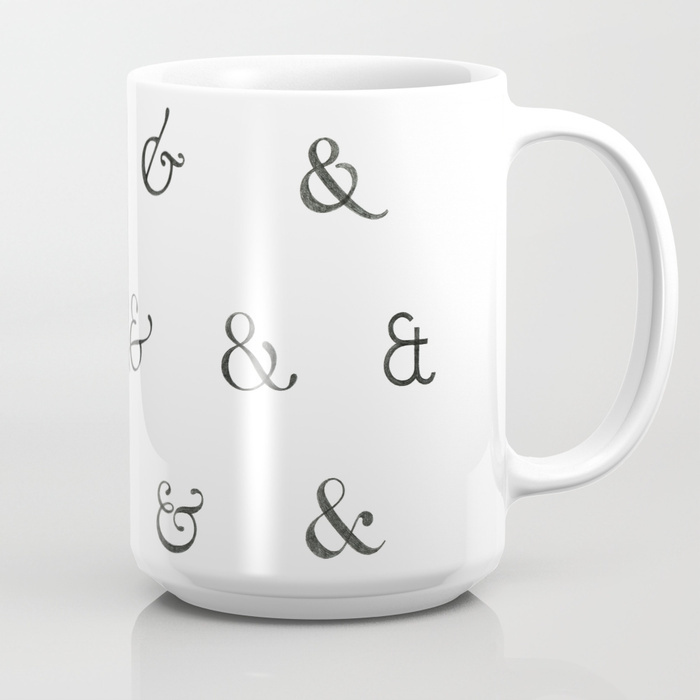 After few sketches, I realized that I already built my own ampersand archive! Drawing a letter in diverse styles can be a good practice for hand lettering. And I think it can be a daily challenge to keep myself up to have drawing habit. This blog is mostly about my own processes of lettering and design logotype with purpose of sharing thoughts, tips and resources gained from design experience.